1Graduate Student, Saveetha Dental College, Saveetha Institute of Medical and Technical Sciences, Saveetha University, Velappanchavadi, Chennai, Tamil Nadu, INDIA. 2Department of Pharmacology, Saveetha Dental College, Saveetha Institute of Medical and Technical Sciences, Saveetha University, Velappanchavadi, Chennai, Tamil Nadu, INDIA. Background: Lutein is a carotenoids vitamin rich in many fruits and vegetables and also available in multivitamin products. It is consumed for its effect on eye disease, cancer, diabetes and other health conditions. Recently, herbal preparations are increasingly used in healthcare systems and concomitant administration of synthetic medications may cause pharmacokinetic or pharmacodynamic interactions leading to very serious medical problems. Understanding the ability of herbal extracts and preparations to modulate the metabolizing enzymes can help the health system for proper treatment of patients and thereby can avoid many adverse effects associated with it. The aim of the study was to find the effect of lutein isolated from Tagetes erecta L on cytochrome P450 isoform CYP3A4. Materials and Methods: The different concentrations of lutein (5 – 100μg/ml), potassium phosphate buffer, CYP450 reagent and substrate 7-Benzyloxy-4-trifluoromethylcoumarin (BFC) were added to a 96-well plate. The fluorescent intensities of the products were measured by Perkin Elmer Enspire fluorescence reader using an excitation and emission wavelength of 405 nm and 460 nm, respectively to examine the effect of lutein on Cytochrome P 450 isoform CYP3A4 and the IC50 was calculated by plotting concentrations of lutein against the corresponding percent inhibition. Results: All the tested concentrations of lutein showed potent inhibition against CYP3A4 in a dose – dependent manner. 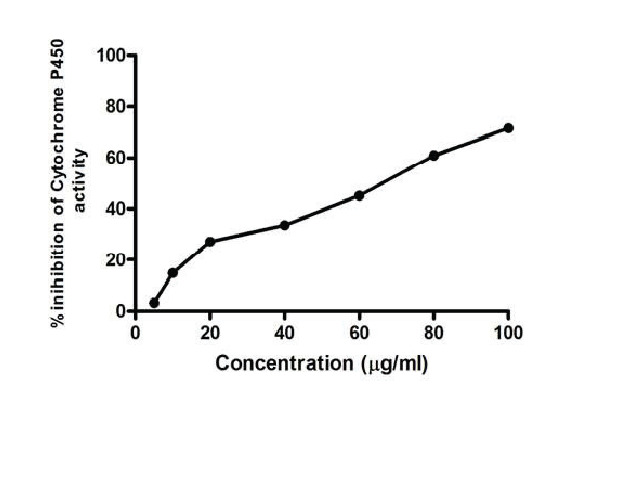 The IC50 value was found to be 35.27μg/ml. Conclusion: The inhibitory effect of lutein indicates the possibilities of herb-drug interaction if it is co – administered with prescribed drugs that are normally metabolised by CYP3A4 enzyme. Meenapriya M, Anitha R, Lakshmi T. Effect of Lutein on Cytochrome P450 (Isoform CYP3A4) - An in vitro Study. Pharmacognosy Journal. 2018;10(6):1093-1095.